Man, I am pooped. It has been a long, long week! All amazingly fun things, dinner parties, Thanksgiving, and a lot of driving…well the driving part wasn’t amazingly fun…. Anyways, as much fun as I have had, and delicious food I have eaten, I was super excited to get home, put on my comfy pants, settle down in front of that beautiful red glow that is Netflix, and a bowl of the worlds best snack. Popcorn. I think this has always been, and always will be one of my most favourite snacks. There is always some in the cupboard, as it lasts forever and you can dress it up a million different ways. It’s crispy, crunchy, and I love eating it one kernel at a time (I know, annoying, but so much fun). First off, microwave popcorn is gross. I know it’s sooo easy, blah blah blah, but have you ever checked out the list of delicious sounding chemicals in there? Not so delicious huh? 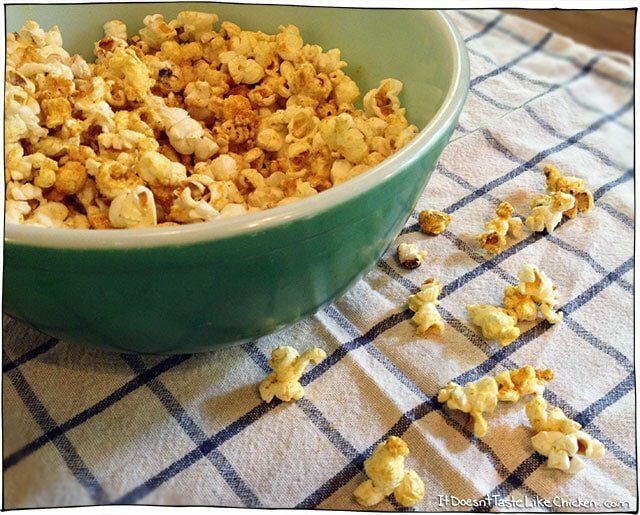 It’s really just as easy to make stove top popcorn. So if you are new to the good ‘ol stove top, let me introduce you. Stove, meet popcorn, popcorn, meet stove. See, that was easy. Put a pot on medium-high heat. Drizzle in your oil of choice, you just need enough to put a thin layer on the bottom of the pot. Pour in your popcorn kernels, just enough for a small layer on the bottom, with lots of room for the kernels to breath. This may look like a tiny amount, but once it pops it will be plenty! 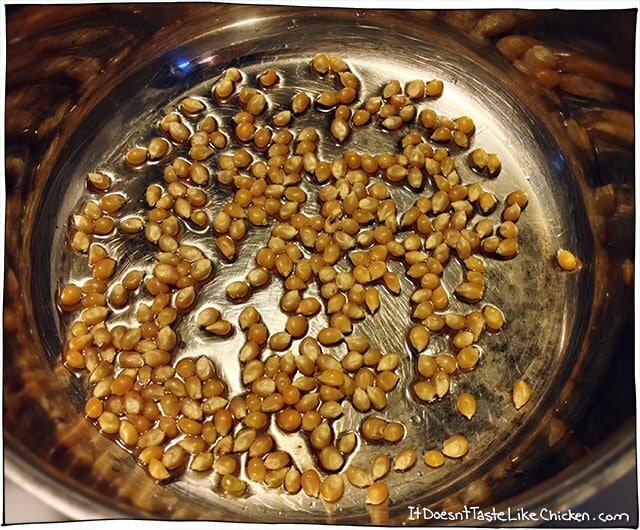 Shake to coat the kernels in oil and put a lid on. Shake every so often, and once they start popping, shake constantly so that they don’t burn. Once the popping stops, dump into a bowl, but be careful because there is always one or two that decides to pop at this moment! Mix up the nutritional yeast, chill powder, paprika, onion, garlic powder, and salt. Some people think garlic powder is gross, and it can be, but true garlic powder is just dehydrated garlic, ground up. So when you buy it, read the ingredients, there should only be one. Garlic. Same goes with onion powder. 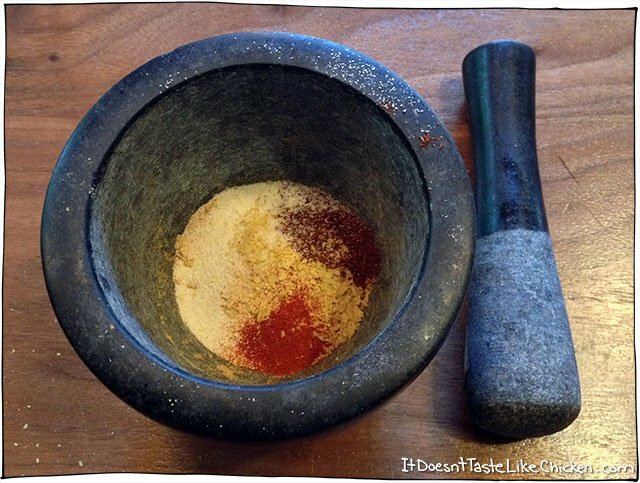 I like to put the spices in a mortar and pestle, and grind them up even further into a very fine powder. If you don’t feel like doing that though, you don’t have too. 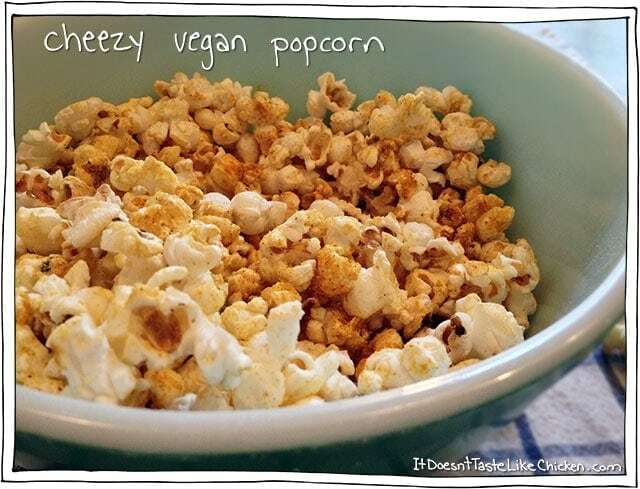 When your popcorn is popped, melt a bit of vegan butter, and drizzle over popcorn while shaking the popcorn. This is optional, but it helps the seasoning stick. 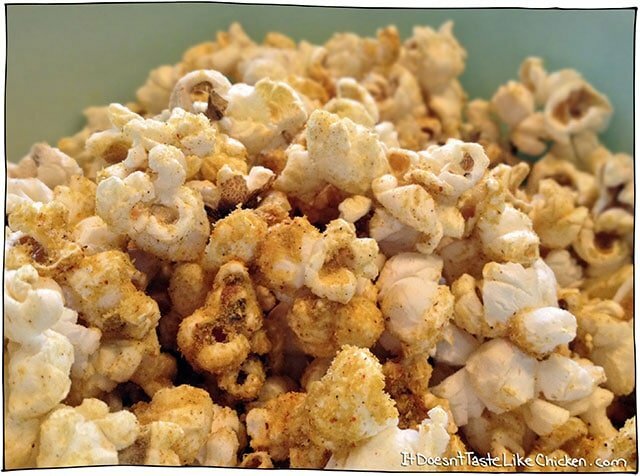 Shake in as much or as little seasoning as you like and toss with popcorn. Yummy yummy yummy! Love the smoked paprika on it! You can also make the popcorn in a brown paper lunch sack in the microwave using little to no oil if you’re like me and trying to avoid clean up at all costs. This recipe is too darn good! Don’t be surprised if you inhale a big bowl of this popcorn in just a few minutes. I love the cheesy flavor combined with the perfect level of spice and heat. I made this recipe for my mom and we sneaked a bag of it into the movie theaters…As far as I’m concerned until movie theaters offer vegan fare this is totally acceptable. My mom, who is not the snacking type, ate most of it before I could get a few handfuls– she kept raving how good it was! Five stars. Hahaha! I love that! I’m lucky enough that some of the movie theatres around me offer vegan popcorn as long as you don’t get butter, but if yours doesn’t I think that’s totally fair game!! Have you ever heard of carrot raids? There’s an NYC group doing these in order to “encourage” non-vegan restaurants to serve vegan fare. I haven’t participated yet but it seems like a good idea. Hopefully this will catch on more and even places like movie theaters will offer healthier options. I just discovered your blog and will be trying some recipes soon, since they look amazing! Thank you for sharing your story and recipes. My favorite popcorn has similar seasoning as yours but I don’t use earth balance to get the seasoning to stick. Instead I spritz on some apple cider vinegar. Gotta love that tangy crunch! Do you think using a spray oil bottle will help the seasoning stick to the popcorn? I don’t want to take too much in the break room to prepare the popcorn. Haha, that’s great! Yes I think spray oil will definitely work. I do that often to my own popcorn using a Misto Sprayer: http://amzn.to/192uASp they work pretty well and then there is no creepy chemicals. Glad you love this recipe so much! Yummy!!!! I made this for my party last night and it was a hit! 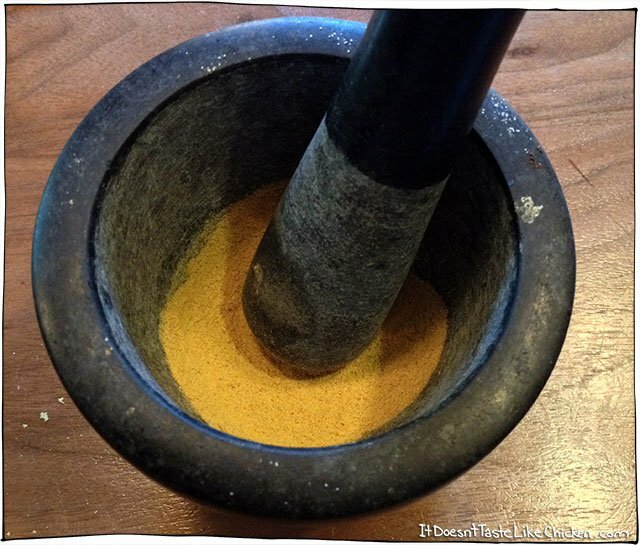 🙂 Also Ioved your advice of grinding the spices together in a mortar and pestle, since I just returned from India and had boughten a mortar and pestle there. Next time I might try mixing it with a batch of the vegan sea salt caramel corn I make and see if I can recreate the Chicago mix vegan style! Thanks for the delicious recipe! I don’t even know what Chicago mix popcorn is, but the combo you just mentioned sounds delicious!! So glad this recipe was a hit. Thanks Beth! I don’t even know what Zumac is!! Do you perhaps mean sumac? If so sumac has a pretty different taste than smoked paprika. Sumac is more lemony, and smoked paprika is, well, smoked, and a bit spicy. That said I totally encourage you to mix up the spices! I love trying new combos and I am sure sumac taste great in this combo! Hmmmm… interesting one. Paprika in pop corn? I will give it a go and get back to you! 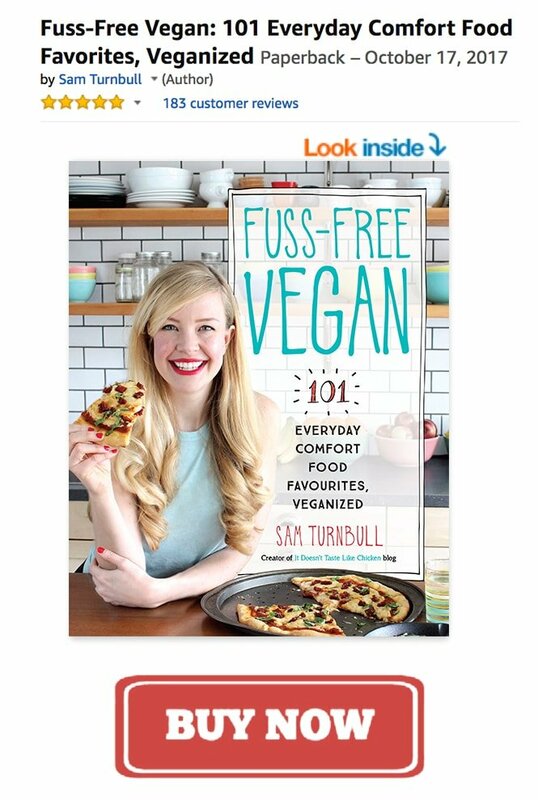 God knows i need help with vegan recipes. For me it’s just food and not Vegan food. Totally agree with your profile. Haha, yeah, people seem to think vegan food is this weird foreign substance, but I like to point out that most people eat vegan foods every day without realizing it! Those fries? Totally vegan. That salad? vegan. Those noodles? vegan. haha! Hope you like the paprika, I sure do! Yum! Rosemary sounds like a great idea!